Kimani Beckford was born in 1988, in St Catherine, Jamaica. He attended the Edna Manley College of the Visual and Performing Arts, where he completed his BFA degree in Painting in 2011. In the same year, he was awarded the Prime Minister’s Youth Award for Excellence in Arts and Culture. 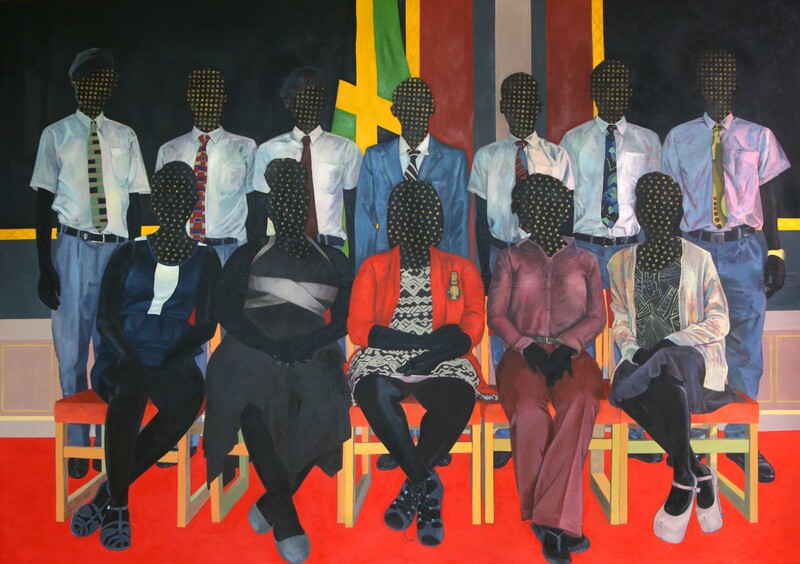 Most recently his work was featured in the Jamaican Pulse: Art and Politics from Jamaica and the Diaspora (2016) exhibition held in Bristol, United Kingdom. 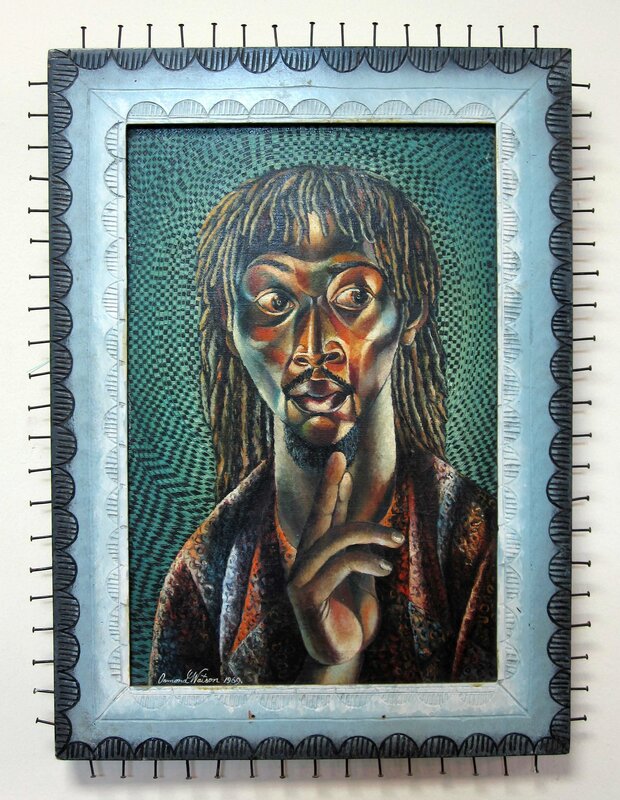 In 2014, he was a recipient of the inaugural Dawn Scott Memorial Award for his submission to the Jamaica Biennial 2014 exhibition held at the National Gallery of Jamaica. Working mostly in paint media, Beckford explores the politics of race and representation in the contemporary context. Beckford lives in St Andrew, Jamaica. 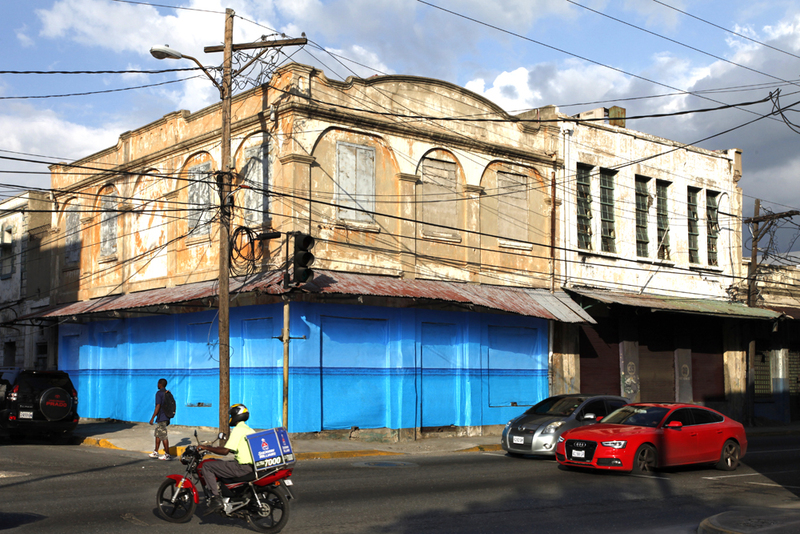 Although the Jamaica Biennial 2014 has now closed, we intend to continue the dialogue. Here is a guest-post by freelance curator and art writer Nicole Smythe-Johnson, who served as project manager for the Biennial and had special responsibility for coordinating projects such as Blue Curry’s. Bahamian artist Blue Curry flew from London, checking his contribution to the 2014 Jamaica Biennial as luggage. Almost 300 feet of wall poster, divided into sections of 8 by 10 feet were packaged in two large rolls and encased in cardboard. Even though the National Gallery had provided the artist with a letter explaining the nature of the work, and the fact that the piece would not to be returned to London after the exhibition (only because it would be destroyed by then), the customs officer was unconvinced. As the person meeting Blue on behalf of the gallery, I was called into the customs hall to explain how exactly these were artworks and not advertisements, and why the giant rolls of poster were of “no commercial value”. I did my best, but after 15 or 20 minutes of trying to satisfy her philosophical and functional queries, I began to worry that we would have to leave the posters at customs that night, while the officials figured out what code should apply to this as yet unheard of class of object; artwork of “no commercial value”. We left the airport shortly after, with the posters in our possession. Seeing that innocuous blue rectangle seemed to drain the fight out of the official. Surely something that simple wasn’t worth arguing over, it certainly didn’t look like it was worth much. This has been a recurring theme with PARADISE.jpg. People ask the same question over and over: “But what is it?” As Blue and his motley crew of volunteer assistants (themselves young artists and art students) went from site to site, slathering wallpaper glue on abandoned buildings and painstakingly moulding the poster to crumbling facades, people came from everywhere to ponder the strange image. 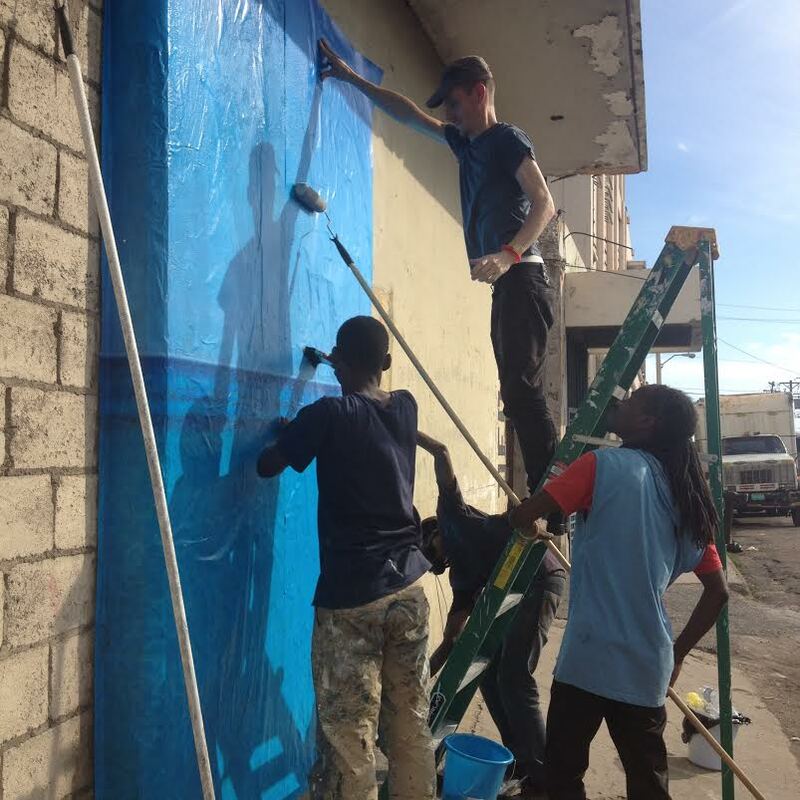 Some thought it was preparation for something else, “are you going to paint it?” Others approved of the intervention, “yeh man, pretty up di place.” Even if they weren’t sure what it was, “likkle colour.” Several offered advice: “Yu nu si se dat nu do good?” or “Wha kinna glue dat? Dem foreign glue naa go work pon dem dutty wall.” The public installation sessions became a little game, what input will be offered next? 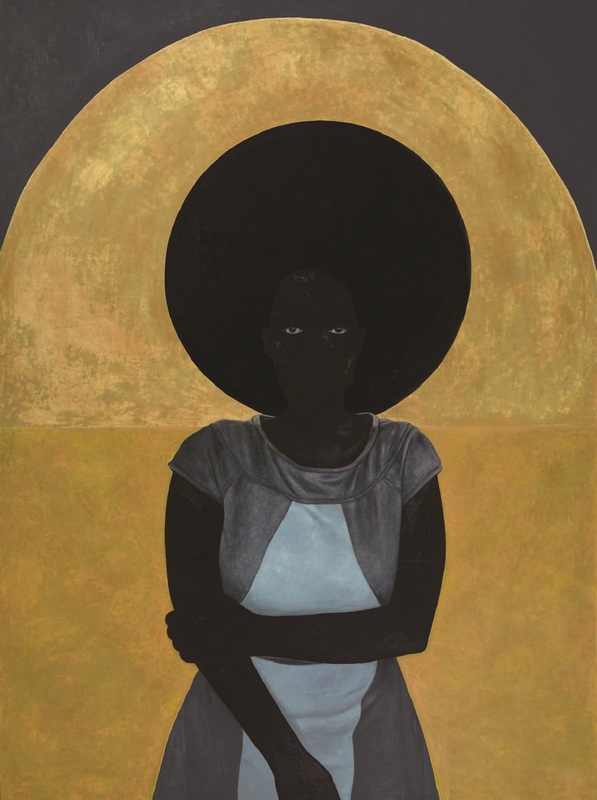 There has been quite a bit of discussion about the similarity of Kimani Beckford’s B.I.B., a large painting on view in the Jamaica Biennial 2014, and Barkley Hendricks’ Lawdy Mama (1969) in the collection of the Studio Museum in Harlem, and some have suggested that Beckford’s painting is overly derivative of the latter. The resemblance between the two works is beyond obvious, and clearly deliberate, but there are also significant differences. 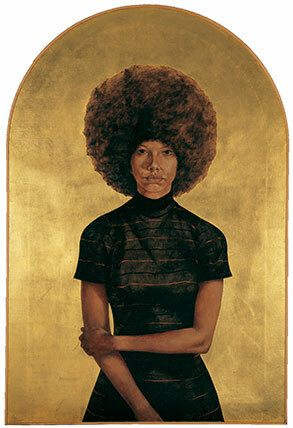 While Hendricks’ realistically painted portrait represents a lanky, brown-skinned young woman with a large Afro who gazes at the viewer with stern confidence, Beckford’s subject is so dark-skinned that her features are practically invisible, except for the schematic eyes. Beckford’s painting is in actuality not a portrait at all but represents a more abstract “type” and reminds more of the “hyper-black” images of contemporary African-American artist Kerry James Marshall than of Barkley Hendricks’ portrait. The flattened, largely undefined features of Beckford’s figure transition almost seamlessly into the equally flat black halo/hair background and the woman also seems younger, shorter and less confident than Hendricks’ subject – an awkward young girl rather than a self-assured young woman. The fashionable, well-fitting 1960s dress in the Hendricks painting has been replaced by a less glamorous and ill-fitting, uniform-like outfit, which further adds to the deliberate awkwardness of Beckford’s depiction. And while Hendricks’ portrait is about life-size, Beckford’s is significantly larger, which gives the figure a more imposing and enigmatic presence. 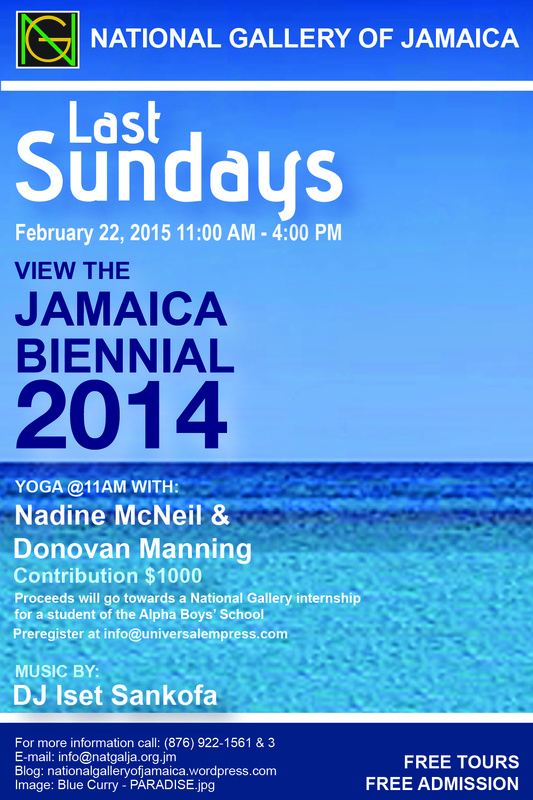 The National Gallery of Jamaica’s Last Sundays event for February 22, 2015, will feature yoga in the gallery with Nadine McNeil (Universal Empress) & Donovan Manning, music by DJ Iset Sankofa, and the Jamaica Biennial 2014, which is now in its final month. Doors will be open from 11 am to 4 pm. The yoga session, is presented under the title Yoga Ethnochoreology, is themed around what McNeil prefers to call African Heritage Month, with a special focus on the “divine masculine,” and will be accompanied by music selected by DJ Iset Sankofa. The yoga session will start at 11 am and the cost is $ 1,000. Proceeds will be used to fund an internship at the National Gallery for an Alpha Boys school student. Interested persons are asked to pre-register at info@universalempress.com. Space is limited, so please register early and bring our own yoga mat. Iset Sankofa will also provide music for the rest of the day. As she describes it, her sets are an “‘all genres considered’ milieu… where dusty Malian Blues takes a night stroll with Dub, Naija hip hop flirts dangerously with Kingston Dancehall grit, and bubbly Brazilian Electronica steams a peace pipe with Afro-Jazz futurism.” Her musical selections have a way of running past the dance-able and the obvious. Usually, the next stop is a bold convergence of history and magic – one that playfully wields the listener into the lush, downright sensuous terrain that music can be. 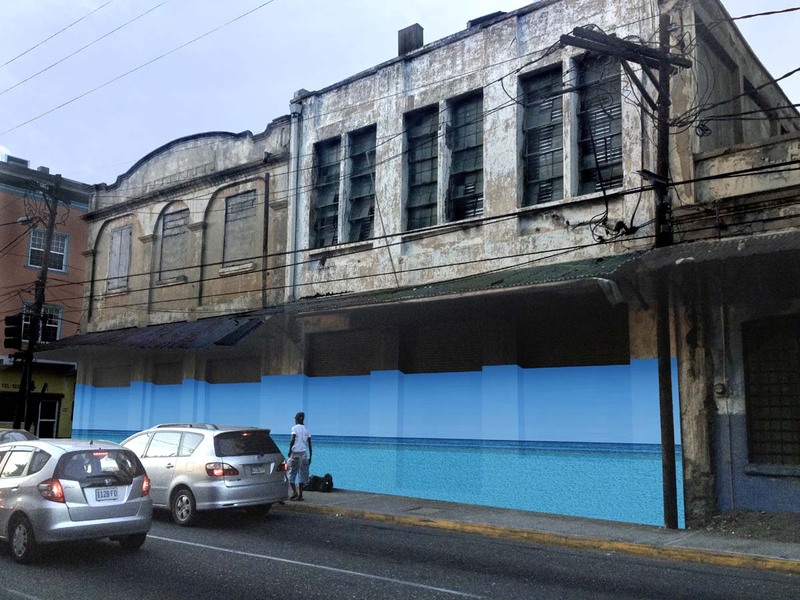 Tours of the Jamaica Biennial 2014 will also be offered on February 22. As is now customary, admission to the NGJ and guided tours will be free. The gift and coffee shop will be open for business and contributions to the donations box are welcomed. Revenues from our shops and donations help to fund programmes such as the Jamaica Biennial 2014 and our Last Sundays programming. The Devon House part of the Jamaica Biennial 2014 will exceptionally be open on Saturday, February 21 and Sunday, February 22, from 12 noon to 6 pm. Regular admission fees will however apply at Devon House.